Our purpose is to share the gospel of Jesus Christ through song. The Music Ministry serves our Church family during Sunday morning worship service as well as funerals and special events. This adult choir ministers harmonious selections at least twice a month. If you have been blessed with the gift of song and are at least 18 years old, you are welcome to join us. No audition is necessary. This group of gifted young people commit their talents to the Lord by ministering faithfully at least once a month. 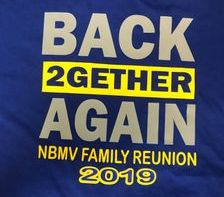 The choir is open to all NBMVCC youth who are 18 years old or younger. No audition is necessary. This fellowship of dedicated believers ministers once a month. The choir is open to all adult males. No audition is necessary. This inspirational group of singers ministers on 5th Sundays. The choir is open to all adult women. No audition is necessary.